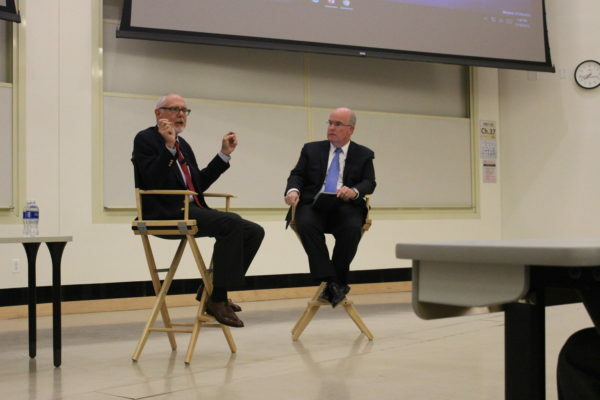 After spending four years as a foreign correspondent in Moscow, Russia, retired National Public Radio reporter Corey Flintoff visited Stony Brook University to discuss Russian-American relations. Flintoff has been a reporter at NPR for over 25 years, covering pirates in Somalia, the earthquake in Haiti and Egypt during the Arab Spring among other topics. During his four-year stay in Russia, Flintoff was able to report in an environment where the national government heavily influences and controls the media. The recent presidential election has brought American attention to the relationship between Russia and the U.S., or more specifically, between Vladimir Putin and Donald Trump. There has been much speculation about the nature of their relationship on the American end, leaving anyone who follows politics with unanswered questions and concerns. Adam Freeman, a freshman journalism major from London, England, admitted that he felt both Great Britain and the United States distrust Russia. “There’s always that skepticism about what Russia’s intentions are in general,” Freeman said. Fortunately, Flintoff was able to provide his audience in Frey Hall 100 with some insight on Russian views. Based on his personal experiences, Flintoff found that Russian people are conditioned to believe that Americans harbor a degree of hostility towards them, despite the fact that the American population is generally much too distracted to pay the Russians much attention. He explained that the Russian government has employed propaganda to convince their people that tensions between the two nations are so high that they are on the verge of war. Flintoff recalled a story in which the Russian government assured its citizens of a strong collaboration with the American government, but the United States State Department vehemently denied a close relationship. He was amazed by the difference in stories between the two countries. “I don’t think [the collaborations] are as promising as the Russian government makes them out to be,” Flintoff said about these supposed collaborations. The Russian response towards America has changed since Donald Trump was named the country’s president-elect, Flintoff said. He went on to say that many Russians feared a Clinton presidency and remarked that he saw news articles headlined “Hillary will surround Russia with nuclear weapons” just days before the election. Flintoff told his interviewer, Terry Sheridan of WSHU, that when it comes to Trump, many Russians have a split view. Some see him as a president they can negotiate with, even if he creates chaos in the U.S, while others seem wary of his vindictive nature and fear he is unpredictable. “You know, the disturbing thing is, we just don’t know,” Flintoff said. Although Flintoff can recall plenty of frustrating situations while reporting in Russia — including being shut out by the government — his four years in Moscow have given him a new respect for the Russian people, culture and history. He ended his discussion by remarking on their resilience, referencing the many Russians who lived through extremely trying situations, such as the transition from the Soviet Union to the Russian Federation. He explained that the ideas of the more powerful Russia of the past have seeped through generations, creating a sense of nationalism in young Russian citizens.